Powelton Methodist Church, the church that started it all. If you find yourself driving in Georgia and come across an overgrown dirt road, take it—you never know where it might lead. 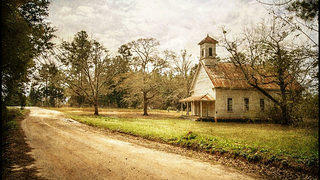 For lifelong friends Sonny Seals and George Hart, a turn down a road in rural Powelton in 2013 inspired them to found a nonprofit dedicated to documenting Georgia's rural historic churches. “We’ve been backroads addicts and history lovers for a long time,” says Seals, who met Hart in 1960. What they found on the side of that dirt road was the Powelton Methodist Church. The building Seals and Hart discovered had been dated to 1830, though the hand-hewn support timbers indicate it may have been built earlier. The church looks like most churches in small, rural communities in the South: a five-bay, one-story frame structure painted white, with a small porch at the entryway topped by a square steeple. Seals made his way over to the graveyard, and one name on a headstone caught his eye: William D. Seals. Surprised to find his unusual last name on a gravestone, he couldn’t get it out of his mind. With the help of the internet, Seals quickly found out that the headstone belonged to none other than his great-grandfather, a Confederate sergeant with the Fifteenth Georgia Infantry. “The discovery of my personal roots led to an interest in the town of Powelton—how did it get there, and where did it go?” These questions centered around the church. “I couldn’t get the image of the little church out of my mind. It was haunting me. How could we, as a civilized society, let something so precious just go away?” Seals wondered. Religion plays a vital role in Georgia's history. Its founders, known as the Trustees, envisioned a mostly Anglican colony that welcomed other Christian denominations (except Catholicism). Overall, Georgia wasn’t nearly as religious as its New England counterparts in its early years. It wasn’t until the second half of the 19th century that the state joined the Bible Belt, and religion became a central part of Georgia’s communities. 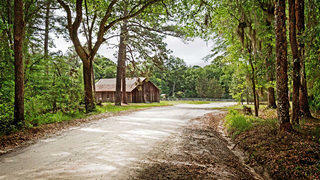 Church buildings evolved from simply constructed log buildings to the sturdier vernacular structures that stand today. While churches were built for a spiritual purpose, they were also the center of the universe for their communities. “It was far more about community than theology,” Seals explains. And the historic buildings still standing today, with their weather-beaten frame cladding, eroding brick steps, and overgrown graveyards, are perfect vessels that contain the history, evolution, and eventual disappearance of so many rural communities in Georgia. Seals and Hart, curious to learn whether others shared their interest in Georgia’s rural churches, founded a website and Facebook page. Their hunch was right. Their page has almost 60,000 likes, and their two-man operation has grown over the past 4 years to include an Instagram page filled with photographic studies of churches snapped by volunteers. 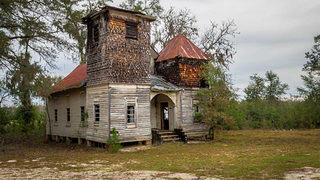 Today, their nonprofit, Historic Rural Churches of Georgia, is dedicated to researching, documenting, and preserving these significant structures and the histories contained within their walls. 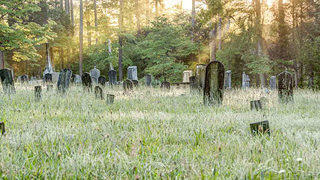 The historic graveyard at Bethel Presbyterian Church in Summerville. Emmaus Primitive Baptist, a simple vernacular building in Carrollton, Georgia. 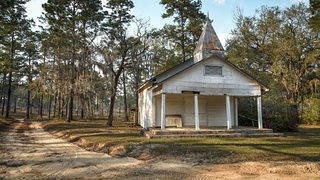 Pine Hill Christian, an African-American church in Brooks County, now abandoned. Oak Grove Methodist, located in Screven County, was completed in 1919. However, the process is not as simple as driving to a church, snapping a few photos, and reading a handy historical marker to learn its history. “The church stories and histories are widely scattered, and a lot of it has been lost. It’s very difficult to retrieve it, especially so in African-American communities,” Seals laments. Armed with a network of volunteer photographers who live in all parts of the state, the organization has documented more than 200 churches that are, in many cases, in danger of disappearing. They find the history in local libraries and oral histories. Frequently, however, it’s a struggle to compile a complete history. Which leads to the next project for HRCGA. Initially, the group's mission focused on preserving these structures through photography and research. Now, though, Seals is hoping to embark on their next phase to find opportunities to save the buildings themselves, so that their histories can be told in a tangible way. Seals reckons that if they can succeed with that, the organization can do a lot more for the churches. To ensure that America’s sacred places continue to serve their communities’ material and spiritual needs, the National Trust for Historic Preservation has joined Partners for Sacred Places and the Lilly Endowment to establish the National Fund for Sacred Places. They’ve finished the initial phase of determining the design of the project, and now they’re deciding how to enable the website interface to let anyone make submissions of personal history, photos, scanned newspapers, and anything that can help permanently document the history of Georgia’s rural churches. The state library system will assist in managing and sourcing it. Also in the works is a documentary series called Saving Grace that will premiere on Georgia Public Broadcasting. It takes viewers down Georgia back roads to historic churches, and introduces them to the people who are working today to preserve them. “It’s a grand story, and we enjoy telling it,” says Seals.